Batman is all about his gadgets, but you'll find two missing gear slots in Arkham Knight if you don't thoroughly explore every environment. Get your gauntlet-encased vigilante hands on the Freeze Blast and Remote Electrical Charge Gun gadgets with this quick locations guide. In a first for the series, not every gadget is acquired throughout the main story. These two extra items are available to collect much earlier than they're required. You'll need them if you're looking to unlock every skill upgrade, or to continue the Riddler's puzzling trophy collectithon. It helps that these two devices can be used in combat, too. So expand your arsenal and find new ways to bring down the criminal element. Learn all about it below. For those with a working copy of the Steam release, check out the Arkham Knight Tweaks Guide and learn how to remove an annoying 30 FPS cap or skip startup logos. 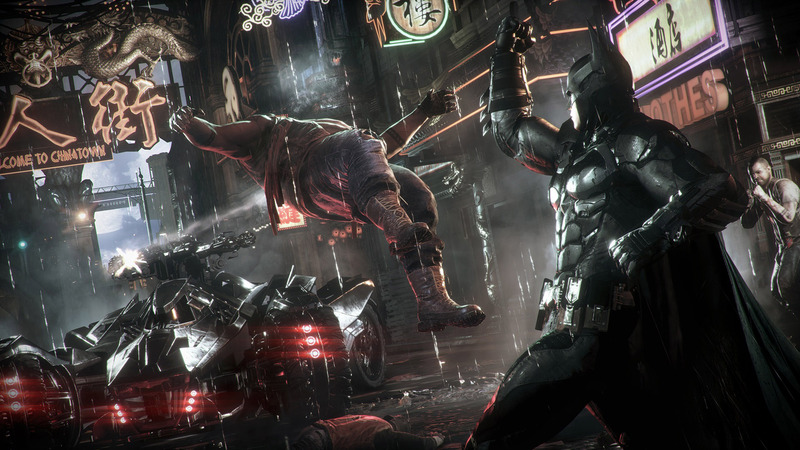 There are two optional gadgets available in Arkham Knight -- the REC Gun and the Freeze Blast. 1. Early in the main story, Panessa Studios will become available. At a certain point, Batman will visit Robin there. 2. Look around the corner from the empty cell on the left. There's a small stand containing the blue Freeze Blast grenade. The Freeze Blast grenade is useful for freezing enemies in combat, trapping goons during predator stealth sections, or blocking steam pipes. It can also be used to create a floating platform over water. Primarily, you'll be using the Freeze Blast to solve Riddler Trophy puzzles. Once upgraded, the Freeze Blast can create a cluster effect that will trap multiple thugs at once, leaving them helpless and easy pickings for Batman's silent takedown. 1. Travel to the GCPD Building office interior. You'll visit this location multiple times in the story. 2. Enter the Evidence Room and walk down the steps into the large room. In the center of the back wall, you'll find Batman's REC Gun inside a display case. 3. Punch the display case to smash the glass and walk inside. A prompt will appear, allowing you to take the REC Gun. Note: The REC Gun is required to complete main missions, but can be collected very early in the story. The REC Gun is a returning weapon, originally introduced in Arkham City. It fire in two modes, allowing Batman to manipulate electrically-charged generators. The REC can also be used in combat. It is especially effective against large brutes or shield-wielding grunts. It will blast shields out of grunt hands, or force brutes to recoil and knockback any nearby thugs.